Wavenet Prime is a complete end to end messaging solution that is deployed around the world serving millions of customers. Designed based on the multitude of Customer requirements gathered over the years it delivers unparalleled flexibility and reliability for MNOs. The paths & roads which have led to many of product behavioral patterns come together in a single unified environment in the best interest of our customers. In an age where operators are faced with rising costs and reducing revenue Prime plans to bring a positive effect to traditional messaging infrastructure. Its modular architecture makes it the go to solution for customers when looking for scalability and high capacity. Prime messaging server is an engineering masterpiece that helps to eliminate the limitations of legacy messaging platforms by combining the latest IT, Telecom and business concepts on to one platform. Virtualization, consolidation and fluid platform licensing are some of the key traits of Prime. Virtualization is the first step in eliminating silo based solution limitations. Prime can be deployed on top of VMware or KVM provided virtual machines (VM) which emulate hardware servers in software allowing multiple virtual servers to run on a physical server sharing network and storage. Built using Erlang, Prime inherits the ability to handle parallel processing and fault tolerance which is essential in delivering 99.999% service uptime in high-stake services. Prime messaging server follows the globally defined standards of GSMA and 3GPP which makes integration simpler to coexist in the complex multi-vendor operating ecosystem. This has been one of our front line products in messaging. The SMSC is responsible for receiving, storing and forwarding short messages in a mobile network. It supports Mobile Originating (MO) and Mobile Terminating (MT) text messaging. It has been in operation since 2003, deployed in A2P and P2P Scenarios handling the main messaging requirement of Operators. The system has been reliable and performance wise stable in handling millions of SMS traffic daily. To date Wavenet Prime SMSC serves more than 50 Million subscribers daily strengthening MNOs around the world. Nowadays the rate of success for a SMS to be delivered is more than 90 % and the need for storing a SMS in the SMSC isn’t a must. With FDA the messages are directly delivered to subscribers in the first attempt reducing the hardware requirement and increasing service efficiency. Messages will be directly delivered to the network via SS7 reducing the load on the SMSC. If the message is not delivered it will be saved in the message store to be delivered later. SMSC supports store and forward mechanism which guarantees message delivery in failure scenarios. The delivery failed or differed messages will be saved in the message store to be resend when available. Prime decodes messages in to its protocol layer exposing packet information which will be used in advance routing. This gives better control and flexibility for the operator to do complex message routing. MNP is offered in multiple methods via Prime SMSC enabling users to retain their mobile number when changing between operators. LBS services are required to interrogate subscriber location from the network. Prime supports multiple mechanisms enabling location information passing from network to the applications. Error code schemes can be defined in the SMSC to address different network behaviors and retry options. This can be also used in routing decision making to give added flexibility. Short message support for more than 160 character in binary and Unicode delivered via multiple interfaces (SS7, SMPP & HTTP). 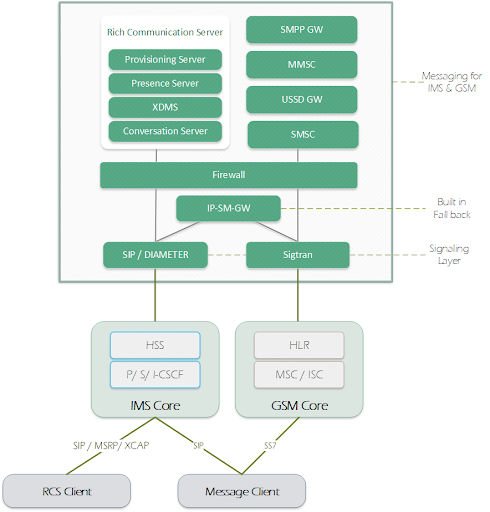 SMPP is an open, industry standard protocol designed to provide a flexible data communications interface for the transfer of short message data between External Short Message Entities (ESME), Routing Entities (RE) and Message Centers. PRIME has an inbuilt USSD gateway which can be used to facilitate the operator with the ability to handle USSD responses. The USSD services can be either push or pulled as and when the requirement presents itself. USSD services are one of the leading methods of reliable communication between applications and clients. This is widely used between operators and subscriber communication and is an essential service for all operators. To make Wavenet Prime a more complete messaging solution the addition of MMSC was in-build on to the platform. The capability to handle Multimedia messages will give an upper hand to the operators, when it comes to competing for dominance. Wavenet MMSC has the capability to support person-to person (phone-to-phone) MMS messaging, as well as application-to-person and person-to-application MMS messaging. This allows widening the use of messaging to increase opportunities for the operators. Messaging is still a prominent driver of revenue for an Operator regardless of the scale of operations. However, the revenue generated from messaging traffic is subject to severe threats such as grey routes, SPAM and international fraudulent SMSs where any vulnerabilities of the network infrastructure is exploited to mimic genuine traffic. This will cost Operators not only losses in terms of not being able to recuperate inter connectivity fees but network overload which can affect delivery of genuine revenue generating traffic and performance of the network. Compensations and complaint management by call centres for any fraudulent messages that subscribers have received can also add up to the costs that Operators incur. There have been instances of subscriber personal details being compromised as a result of SPAM messages and where subscribers have been billed unduly due to fraudulent messages. Regulations have become more stringent to protect subscriber rights and confidential information and security standards such as IR 70 and IR 71 are being heavily enforced by Regulators to Operators. Wavenet Prime Firewall is a holistic fraud prevention and network security solution which provides protection against all forms of network threats. It filters Mobile Originated messages (MO), Mobile Terminating messages (MT) and Application traffic (SMPP). Subscribers are targeted by fraudsters to receive unsolicited SMS. These unintended messages tend to have various content including commercial information, bogus content, requesting of personal information which invites responses from the receivers. These messages can come through from a mobile user, external SMSC or a third party application. Wavenet SMS Firewall detects SPAM messages using multiple detection mechanisms which can be defined globally or network wise. Signature mechanism is used to identify SPAM content which are circulating within the network creating unnecessary traffic . Chain messages & other SPAM can be identified using partial matching, fuzzy rules & shuffled words. A detection optimizer which uses percentages for signature matching. Bayesian algorithm is used with a trained word database for content analysing. In network flooding, exceeding number of unwanted messages are directed to the mobile network. Flooding can happen from MO, MT, SMPP & SRI requests which are originated for mobile devices or applications. Prime scans through total system and individual node traffic to detect security threats based on message frequency settings. Spoofing is receiving messages with faked MSISDN which can leads to wrongfully charging customers and identity misuse. Spoofed MO messages can from the MSC/VLR. Detection will be done analysing signalling level information. Prime Firewall have functionality will be used to make an accurate decision. Once detected alarms can be triggered or automatic blocking is possible. MT faking can be a issue for most operators and the threats can originate locally or internationally. Fraudsters use illegal links to access the mobile network and terminate messages impersonating SMSCs. This will result in home operator terminating local or international SMS traffic without a return (termination charge). In GT Scanning Prime FW will monitor the originating point and the number of requests to determine security breaches. Prime Firewall includes Real-time detection and blocking, Alarm triggering and Load balancing.